A British soldier could face charges over a "friendly fire" incident in Afghanistan when three members of the Royal Anglian regiment were killed. 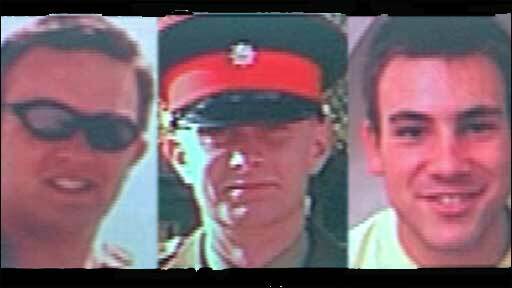 Privates Aaron McClure, from Suffolk, and Robert Foster and John Thrumble, from Essex, died on 23 August 2007 while on Patrol in Helmand province. Two other soldiers were injured when the US aircraft bombed their position. Now their Forward Air Controller, who called in the air support, could face legal action, according to the MoD. It is feared that the wrong grid reference was sent to the jet which launched the 500lb bomb at the British position. The Ministry of Defence told BBC News he could face charges ranging from manslaughter to "failing to follow his duty". But John Thrumble's father Stephen said he had concerns about one person being made responsible for the deaths. "When you put a multi million pound killing machine up in the air," he said. "How can just one man on the ground be responsible for what it does?" Aaron McClure's mother Lorraine, said: "The MoD are making the soldier a scapegoat, pushing the blame off themselves onto one individual - who's probably suffered enough." The MoD said independent prosecutors had yet to decide whether to charge the air controller.